A tremendous entry of cattle for the first sale in July. 111 dropped calves sold to £550, £530 and £490 for Aberdeen Angus and Hereford bulls from Banbridge only three months old. A larger entry of heifers cleared up to £1,160 with a Clough farmer averaging £1,091 for seven Charolais heifers. Over 60 bullocks sold to £1,220 on two occasions from a Castlewellan farmer. Suckler stock cleared up to £1,650 for a Belgian Blue cow with a heifer calf at foot. Fat cows sold to £1,045 for a 746k Limousin. The usual big entry of weanlings saw males sell to £925 and females to £850. Banbridge farmer: £550, £530, £490 for three month old Aberdeen Angus and Hereford bulls. Kilkeel farmer: Hereford bulls, £380. Rathfriland farmer: Belgian Blue bulls, £375 and £320, heifers £290. 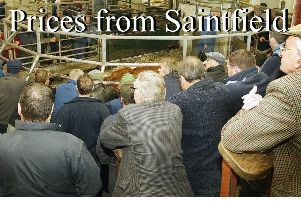 Shinn farmer: Hereford heifers £305 twice. Cabra farmer: Simmental bull £350. Annalong farmer: Hereford heifers £280 and Belgian Blues £275. Downpatrick farmer: Aberdeen Angus heifers £270 and £265. Downpatrick farmer: pen of Charolais, 460k at £870, 370k at £800, 320k at £750, 348k at £785, 332k at £745, 342k at £700 etc. Bryansford farmer: 418k at £850, 388k at £735. Carginagh farmer: 350k at £850. Warrenpoint farmer: 330k at £745, 350k at £670 and 328k at £665. Newry farmer: 276k at £640, 284k at £640. Clough farmer: 614k at £1,160, 546k at £1,150, 540k at £1,125, 518k at £1,100, 498k at £1,095, 546k at £1,080, 456k at £925. Ballyroney farmer: 380k at £780. Rostrevor farmer: 330k at £745, 320k at £715, 334k at £640, 316k at £610.